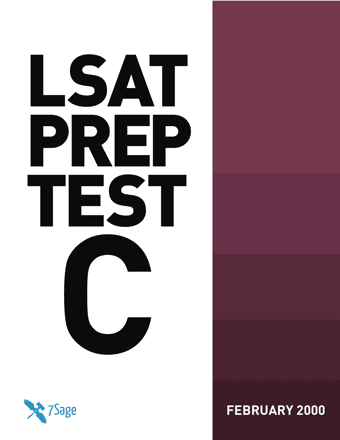 I took PrepTest C (the February 2000 LSAT) under simulated testing conditions. I want to share some of my thoughts with you. This post will cover Logic Games for which I have already made the videos lessons (with links below). Game 1 - At a water carnival, eight lifeguards will participate in two events. One event is a boat race and the other is a rescue exercise. These lifeguards will be grouped into four two-person teams. Game 2 - A critic ranks exactly seven restaurants. These restaurants are named Lautrec, Medici, Pastilla, Robusto, Scheherazade's, Tantoko, and Vistula from the best - the highest rank - to the worst - the lowest rank. Game 3 - Three parks, Jessup, Island, and Hilltop, contain attractions. The attractions are of five types: fountain, garden, museum, playground, or theater. Game 4 - Dynamic Motors will assemble four new automobile models. Over the next three years, the models Volante, Whisper, Xavier, and Ziggurat will be assembled in its five factories F, G, H, J, and K.
This is a grouping game with an unusual setup. That means it's hard initially. If you aren't careful, it reads like an In/Out game. Once you realize that it's not, that in fact for each of the two events, you are asked to group the eight lifeguards into four teams of two persons each, you'll see the right game board. From there on out, this game is easy. This is a tough sequencing game. You have to be proficient in handling conditional rules in a sequencing game. The conditional rule in this game breaks up the game into, essentially, two sub-game boards. Beyond that, your proficiency with basic sequencing games will determine how quickly you can move through the questions. This is an easy grouping game with a chart. If you setup it up with a chart, you can figure out three sub-game boards that represent all possible worlds. The questions are fast. This is a hard, unique game. The game board doesn't look like any game board that we're used to. So, you have to spend some time figuring out what game board works best to organize the information in this game. The rules are also difficult to represent visually. As with all games, spend time upfront understanding the setup, the game board, the rules, and the pieces. Otherwise, the questions will simply be a waste of time. So, what's the take away? Games two and four games were hard. You have to be able to move through the easy ones very quickly to save up enough time to tackle the hard ones.